Scientologists and their guests gathered July 23 to launch the next chapter in the history of Scientology in Hungary with the grand opening of the Ideal Organization of Budapest. Mr. David Miscavige, Chairman of the Board Religious Technology Center, officiated at the grand opening ceremony of Hungary’s first Ideal Org. Mr. Miscavige’s vision and leadership has inspired more Church expansion in the past decade than in the previous 50 years combined. With this grand opening, Ideal Churches of Scientology now total 52 across six continents. The Ideal Church of Scientology Budapest was dedicated July 23, 2016, before an excited audience gathered to welcome the Church to its new home. Thousands greeted the grand opening of Budapest’s Ideal Org, located in the city’s District XIII. On hand were Scientologists from across Hungary and neighboring Central Eastern European countries. 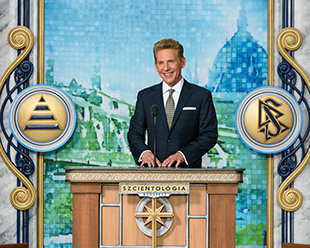 Mr. Miscavige was joined by leading Hungarian Scientologists for the dedication ceremony. 3,500 Scientologists and their guests converged on the city of Budapest, Saturday, July 23, to celebrate the grand opening of their new Ideal Org. A lively performance of the Hungarian traditional dance—Szatmári—commenced the grand occasion. “It was 15 years ago when you first reached out to me. You wanted to run a marathon across Hungary and wake up our country to drugs. And so together we launched the first Drug-Free Hungary Marathon in March 2002. And since that time you have swept this nation with our message. Reaching more than 400 towns and cities. Distributing over two million anti-drug booklets. And inspiring the youth of an entire nation to live drug-free lives.” —Dr. István Komáromi, Brigadier General, Police Chief of Pest County Ret. Mr. David Miscavige	with (left to right): Ms. Ágnes Debreceni, Board Member, Gárdonyi Education Foundation of Hungary; nationally renowned novelist, Mr. István Nemere; Dr. István Komáromi, Brigadier General, Police Chief of Pest County Ret. ; and Dr. Ildikó Hekáné Szondi, Vice-Chair for Culture, Education, Tourism and Youth, City of Szeged. Upon grand opening, the doors swung wide and the crowd took their first glimpse of the new Ideal Organization of Budapest. Scientologists in attendance from across Hungary celebrate the grand opening of Budapest’s Ideal Org and tour its expansive facility. Overlooking one of the city’s main thoroughfares, Váci Road, the new Ideal Organization of Budapest rises six stories in the heart of the thriving District XIII. Since 2000, the Church of Scientology of Budapest has served a growing congregation across Hungary and Central Eastern Europe. It continues that tradition of far-reaching service from its new home as an Ideal Organization in Budapest’s District XIII. Reception Open seven days a week, morning to night, the Church of Scientology of Budapest welcomes anyone wishing to obtain an introduction to Dianetics and Scientology. Scientology Public Information Center The Church of Scientology Public Information Center offers some 500 films, providing a complete introduction to every aspect of Dianetics and Scientology. It includes the beliefs and practices of the religion as well as the many humanitarian initiatives and community outreach programs the Church supports. The Chapel Scientology services and ceremonies are convened in the Chapel, including Sunday Services open to members of all denominations. It further serves as an ideal venue for workshops and events in the name of community collaboration for the betterment of Budapest. The café welcomes visitors touring the Ideal Org or attending the many scheduled events and for parishioners during breaks in their Scientology services. Dianetics & Scientology Bookstore The Church of Scientology of Budapest Bookstore makes available L. Ron Hubbard’s works on Dianetics and Scientology. In all, Mr. Hubbard’s legacy spans tens of millions of published words in dozens of books and thousands of recorded lectures. Materials are available in 50 languages. Introductory Services The Church of Scientology of Budapest provides for the delivery of all Introductory Services. These include evening and weekend Dianetics and Scientology seminars imparting an overview of the fundamental principles and their application for living. Among the many introductory services available at the Church of Scientology of Budapest is an entire array of Scientology Life Improvement Courses to help better any aspect of one’s life. The Ideal Church of Scientology of Budapest—a beacon for spiritual freedom in Central Eastern Europe. Already there are epic tales about Scientology in Hungary—a country that for centuries has cherished its myths and histories. In the last days of the 1980s and the dawning of the 1990s, totalitarian, atheistic Communism receded from Eastern Europe, much of Asia and Russia. Long starved for spirituality, Hungarians—like all people who had suffered under the Soviet commissars—quickly sought truth and religion. In 1988, a single copy of L. Ron Hubbard’s Dianetics: The Modern Science of Mental Health pierced the iron curtain and a movement was born. Now, some 25 years after first planting the Scientology banner in Budapest, the religion opened an Ideal Church of Scientology Organization, in the historic city. The Budapest Ideal Org is the 52nd Ideal Org that has opened since 2003, and with an accelerating pace of inaugurations, another 50 are already in the making. As a country more or less situated in the middle of everywhere, Hungary has had its share of visitors. Nomads from the east a thousand years ago founded a kingdom and crowned King Stephen I. Then came Mongols and Ottomans, the Hapsburg Austrians, Germans and Russians. There have been wars and great upheavals, tremendous cultural surges and marvelous music, and don’t forget the cuisine. Even spicing history up in the 15th Century, a gent named Vlad (AKA Dracula) was sharpening his canines in the Transylvanian corner of Hungary. So, as eddies and floods of civilization washed across Hungary, a great city was built on the hilly west side of the Danube, Buda. A slightly younger civic sibling, Pest, arose on plains on the east side of the great river. Budapest today is the cultural, political, and commercial hub of Hungary, and one of the great metropolises of Central and East Europe. Full of great, historic landmarks—Buda Castle, the Fisherman’s Bastion, the Chain Bridge, and so many more—a new emblem of liberty has been added to the city, the culmination of work by thousands of Scientologists. Scientology’s Ideal Org stands amidst Budapest’s bustling heart. Located on one of the city’s main thoroughfares, Váci Road, in the thriving District XIII, the 64,000-square-foot Church is impossible to miss. Its 85-foot Scientology sign extends across its western elevation and announces its presence to the more than 100,000 commuters each day. The Church’s grand opening is the culmination of the religion’s rapid rise since its founding in Hungary a quarter century ago. In fact more than 33 missions now dot the Hungarian landscape and beyond into neighboring countries of Romania, Slovakia and the Czech Republic. And representatives from each were among the 3,500 Scientologists and guests present at the grand opening ceremony. Chief among the attendees were leading lights of Hungarian society welcoming the Church to its new home: Dr. István Komáromi, Brigadier General, Police Chief of Pest County Ret. ; Dr. Ildikó Hekáné Szondi, Vice-Chair for Culture, Education, Tourism and Youth, City of Szeged; Ms. Ágnes Debreceni, Board Member, Gárdonyi Education Foundation of Hungary; and nationally renowned novelist Mr. István Nemere. The new Budapest Ideal Org provides visitors with an introduction to Dianetics and Scientology, beginning with the Public Information Center. Its displays, containing more than 500 films, present the beliefs and practices of the Scientology religion and the life and legacy of Founder L. Ron Hubbard. The Information Center also offers a detailed overview of the many Scientology-supported humanitarian programs. These include a worldwide human rights education initiative; a far-reaching drug education, prevention and rehabilitation program; a global network of literacy and learning centers; and the Scientology Volunteer Ministers program, now representing the world’s largest independent relief force. Budapest’s Chapel provides for Scientology congregational gatherings, including Sunday Services, weddings and naming ceremonies, as well as a host of communitywide events open to members of all denominations. The Ideal Org further includes multiple seminar rooms and classrooms, in addition to an entire floor dedicated to Scientology auditing (spiritual counseling). The Budapest opening continues an unrelenting growth period for the Church in the past 12 months. In fact, it caps a decade of Church expansion that out-powers the previous 50 years combined. Recent Ideal Church openings have occurred in Atlanta, Georgia; Milan, Italy; Tokyo, Japan; Bogotá, Colombia; and Basel, Switzerland. Also, the Church recently opened Scientology Media Productions, a five-acre, technologically cutting-edge studio in Hollywood, California, in which the religion’s message will be proclaimed via television and radio broadcasting, Internet and social media and every other media platform.